The regime has also learned from past insurrections. In October 1964 Ibrahim Abboud’s military dictatorship was overthrown, followed by that of Jafaf Nimeiri in April 1985. 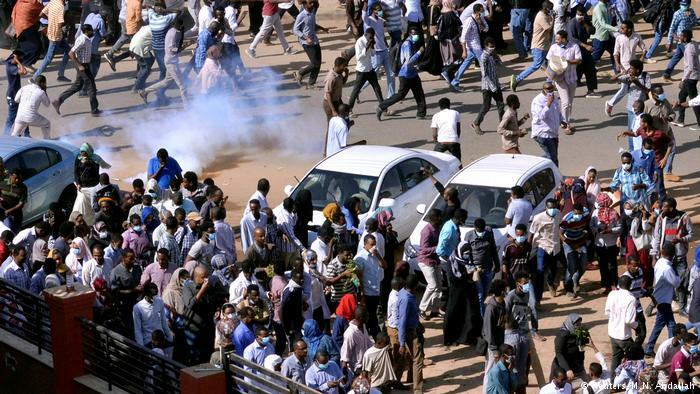 Popular uprisings of students, professionals and workers succeeded when troops in the capital Khartoum, who were supposedly loyal to the regime, went over to the side of the insurgents. Today those troops are largely dispersed to the regions, whilst dealing with the current resistance in Khartoum is left to riot police and al-Bashir’s own praetorian guard plus the Rapid Support Forces (also know as the Janjaweed militia). In a globally stagnant capitalist world peripheral zones like Sudan suffer the most. Sudan ranks 174th on the wealth list, making it one of the poorest countries in the world. However there are local factors which have kicked in to make matters worse. In 2005 South Sudan, after years of war, finally set up as a separate state taking with it two thirds of Sudan’s main export commodity, oil. Although Sudan has managed to recoup some of this (since it charges a high price for South Sudan’s oil exports through its Red Sea ports) GDP fell by over 10%, and helped produce a great hole in state finances. Sudan already has debts of over $56 billion whilst, according to Reuters, the central bank only has $1.1 billion in reserves or about enough to pay for about seven weeks of imports. The government solution has been to print money to keep functioning. As a consequence, the value of the Sudan pound has fallen and inflation has now reached 70%. 46.5% of the population live below the poverty line (living on less than $1.90 a day). In some regions like Northern Darfur that figure climbs to two thirds of the population. Sudan’s designation as a “state sponsor of terrorism” with a war criminal indicted for “genocide” and “crimes against humanity” at its head has made it difficult to get international investors to commit to any project. The atrocities committed in the war in Darfur have continued to haunt the regime. Here 300,000 were killed and 1.2 million displaced as the Government wreaked revenge on a region where an independence movement had arisen. Again, the bulk of the rapes and murders were largely carried out by the so-called Rapid Support Force or Janjaweed militia. According to David D Kirkpatrick of the New York Times, Sudan has sent as many as 14,000 soldiers to Yemen. Grotesquely these include both members of the Janjaweed militia and their victims. These are the child soldiers from Darfur who are there because the civil war robbed their families of their livelihoods. Now they serve under the Janjaweed. Kirkpatrick cites the case of one Darfuri boy who was recruited by the Saudis for $10,000 at age 14. The story of Sudan’s unacknowledged involvement in Yemen first came to light in September 2017 when a Janjaweed General, Mohammad Hamdan Daqlu, inadvertently admitted that 412 Sudanese had been killed there. Given that over 60% of Sudan’s exports end up in Saudi Arabia or the UAE, and that the Gulf States are alleged to have given Sudan a $2 billion loan in 2015, it is perhaps not surprising that this alliance of convenience on both sides has developed. What the whole sordid episode shows is that any idea of outside pressure on the war criminal al-Bashir in the current crisis can be forgotten. Already al-Sisi, the Egyptian dictator, who might fear the same fate one day has openly announced his support for the al-Bashir regime (a further 15% of Sudan’s exports go to Egypt). So where does this leave the balance of forces in the current struggle? It is perhaps no accident that the current crisis was sparked off in the North Eastern Nile town of Atbara. Nicknamed “The City of Steel and Fire” by workers, it was the main railway centre in the country. This was the town of the stronghold of the Sudanese working class and “became one of the most dynamic and militant labor movements in Africa and the Middle East”. Led by the railway workers’ union and the Sudanese Communist Party (at its height – when it was the largest Communist Party in Africa – it was a Stalinist offshoot but today it is a smaller nationalist outfit which thinks it can somehow represent “socialism” in a “democratic” government! ), the workers of Atbara were not only in the vanguard of the struggle against colonialism but also in bringing down Abboud in 1964 and Nimeiri in 1985. However, today Sudan faces the same (if not more blatant) disparities, between the ever more bloated rich and the desperately poor masses, as in every other state in the world. It is apparent that even the once prosperous middle class, who gave parts of Khartoum the air of being like any other functioning city, have suffered. Many have lost their livelihoods or left to find a better life elsewhere. It is no surprise therefore that today the main organisers of the demonstrations are the professional associations of teachers, doctors and engineers. Once much respected in Sudanese society, these groups have seen a massive decline in their living standards over the last two decades. Doctors, for example now earn as little as $30 a month. Nearly all Sudan’s wealth and assets are now located in Khartoum and Port Sudan, and these have been long since acquired by a narrow set of political elites, regime loyalists, and their business allies. Three quarters of the state budget goes to the military whilst those who have access to state contracts have a source of corrupt finance. This elite class are the ones who travel abroad, engage in conspicuous luxury consumption ($2 billion worth of cosmetics are imported by them each year, and the wedding industry now puts on massive extravagant displays lasting for days at a time). As one Sudanese journalist put it, as al-Bashir’s “cronies whizz around the city in their trademark white Land Cruisers, people have grown tired of a regime that cannot be bothered to hide its corruption.” However, the money currently flowing to the security forces ensures the loyalty of those killing protestors on the streets. Sudan today, like so many places, is at an impasse. In Africa it is not alone. Since the global financial speculative bubble burst in 2008, the number of riots and conflicts in Africa has gone from around 300 a year to nearly 4000. Sudan's economy is close to collapse and the population have reached that point of desperation in which they see they have no option but to demand “the fall of the regime”. But if the social movement against the regime is determined in its goal, al-Bashir is equally unable to back down. More blood will be shed before this situation is played out, unless there is an internal coup within the ruling party. It is known to be divided, but so far there is no evidence that anyone has made any move to get rid of their leader. Al-Bashir thinks he can ride out the storm (and has the added incentive to hang on since, if he is deposed, the International Criminal Court will be awaiting his handover). He appears to think that a combination of repression (he has called on the riot police to “exact penance” on demonstrators), the usual denunciation of the protestors as the tools of foreign powers, and a few concessions will be enough to placate the wrath of the population. He thinks the crisis can be resolved by simply reintroducing targeted subsidies, increasing civil servant pay, stabilising the Sudanese pound, or just sacking this or that minister as a scapegoat. As long as he has the loyalty of the army, and keeps control of the National Intelligence Service, he has a good chance of facing down yet another challenge to his 29 year rule. Yousra Elbagir “Sudan’s protesters show unprecedented resolve” Financial Times 7 January 2019. As this article was being written the health minister was sacked over the high price of medicines (when they are available) but the real cause of this is the lack of foreign exchange of the pharmaceutical companies, another consequence of al-Bashir’s policy of printing money and devaluing the Sudanese pound.